The type of Tudor furniture available was dictated by the wealth of the owners. Most furniture in the Tudor period was made in the country and only the very rich could afford to import furniture from abroad. Tudor furniture was made of wood which was obtained locally, most popularly wood. The poor Tudors slept on straw pallets or on rough mats which were covered with a sheet. There were under covers and a log was used instead instead of a bolster or pillow. The wealthy Tudors purchased Four poster beds. The elaborate four poster beds consisted of a headboard with carved panels, four carved posts, a tester and valance of embroidered material. Heavy curtains were draped from the posts allowing privacy. Sumptuous embroidered covers made with the finest materials were laid over the mattress and pillows. The mattresses were made with down and feather. The poor Tudors could not afford the luxury of individual chairs, in fact, chairs did not become common items of furniture until the seventeenth century. Wooden benches were the more commonly used furniture to sit on. Individual chairs were therefore rare and were designed with high straight backs. The seats and arms were sometimes stuffed with rushes. The type of chair most associated with the Tudor era are the 'settle chairs' Settle chairs had high straight backs and a panelled storage space was built into the bottom of the chair. Wooden benches were the most common type of table and used for general use. Trestle tables were used for dining which enabled quick removal after the meal to make room for entertainment or for the servants to sleep. There were some free-standing tables which were occasionally covered with a linen cloth. Chests, used for storage, were also used as both tables and chairs. Various types of highly practical chests were used during the Tudor period. The chests used as permanent pieces of furniture were designed with legs keeping the chest away from the filthy rushes and sometimes vermin infested floors. These chests also tended to be highly ornate and heavy. Some chests were specifically designed for travelling which came without feet or legs for easier loading and transport. These were extremely important to the wealthy Tudor way of life where the royal court constantly moved from one residence to another on 'progresses'. The Tudor furniture referred to as 'Stepped Buffets' were a series of wooden planks with a number of stepped shelves. The number of shelves indicated wealth and rank! These 'Stepped Buffets' were covered with rich drapes and assembled for use at banquets and feasts. The finest plates of gold or silver were displayed on the 'Step Buffet' and servants served from them. The 'Stepped Buffets' were the predecessors of the 'sideboard' and the word 'Buffet' is now in common use to describe a 'help yourself' meal of 'finger food'. 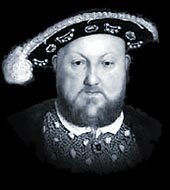 Each section of this Tudors website addresses all topics and provides interesting facts and information about Tudor Furniture. The Sitemap provides full details of all of the information and facts provided about the fascinating subject of the Tudors!